Hark, the cry of the golden beast. Behold the radiance of the sacred blade. Bear witness as the magnificent guardian deity passes by, bringing all those who look upon him a moment of glory. 40% boost to Wind Elemental ATK. 60% boost to Wind Elemental ATK. Refresh all Wind allies (Healing cap: 400). Duration: 2 turns. 3T3 turn cooldown. "Veil" is an unofficial name used by the wiki for this status effect. Its actual in-game name is "Immune.". Can only be summoned once per battle. 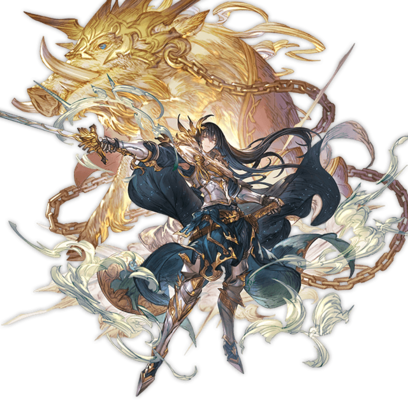 He is voiced by Hikaru Midorikawa as a boss in Unite and Fight, however his summon version is unvoiced. He shares this voice actor with Albert. This page was last modified on 17 April 2019, at 22:46.